Although 1Law4All sent east coast North Island members details of the Mahia Peninsula rip-off claim and public meeting early in 2015, this is the first nationwide newsletter to all members for the year. The Party plans to send you regular newsletters throughout the rest of the year. Perhaps with sporadic surges when some egregious bit of racism needs to be drawn to member’s attention. Special Maori Boards in local government and the latest foreshore and seabed claims are examples. All things that violate the principle of one law for all. There is no other political party that is focussing on these important issues. 1Law4All recently sponsored or supported two public meetings in the Hawke’s Bay. At the Napier Sailing Club on 2 February, Dr. Hugh Barr explained the ramifications of the Rongomaiwahine tribe’s claim to the whole of the foreshore and seabed of the Mahia peninsula (out to 22.2km). At the Havelock North Community Centre public meeting on 24 February, some 1Law4All members assisted Hastings Against Amalgamation as the proposed plan included an un-elected and unaccountable part-Maori Board as part of the proposed Greater Hawke’s Bay council. It is often at local level that the tribal elite pushes the hardest for special privileges – and all too often gets them. Hence the importance of these local meetings in informing the people of what is happening on their turf. They are also good opportunities for bringing our message to the public and getting new members. These local issues need attention, now. Certainly until the next local body elections in October, 2016. At that time, 1Law4All might be able to stand candidates in areas where local council racism is rampant. The party can use the experience to take on national issues. Because of the importance of having a broad based party, this current month of April is MEMBERSHIP MONTH. We appeal to those who have not renewed their membership to do so and ask existing members to enlist new ones. Until now, newsletters have been sent to those whose memberships have lapsed. However, this newsletter will be the last for non-financial members. An annual membership fee of $10 is very reasonable for receiving regular racism-exposing updates and a small price to support ensuring that the future of New Zealand will be one of equality and democracy and NOT separatism and race-based preference. No other political party is prepared to give this supremely important issue the priority that it needs. 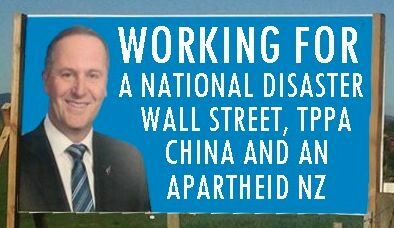 There is no other party opposing racism in NZ. The country will go down the path of separatism/racism if 1Law4All fails in its efforts. no one wants to see more and more young people opting out and emigrating to Australia and other places that are not afflicted by this racist cancer. So, please, $10 for that is not a big ask. 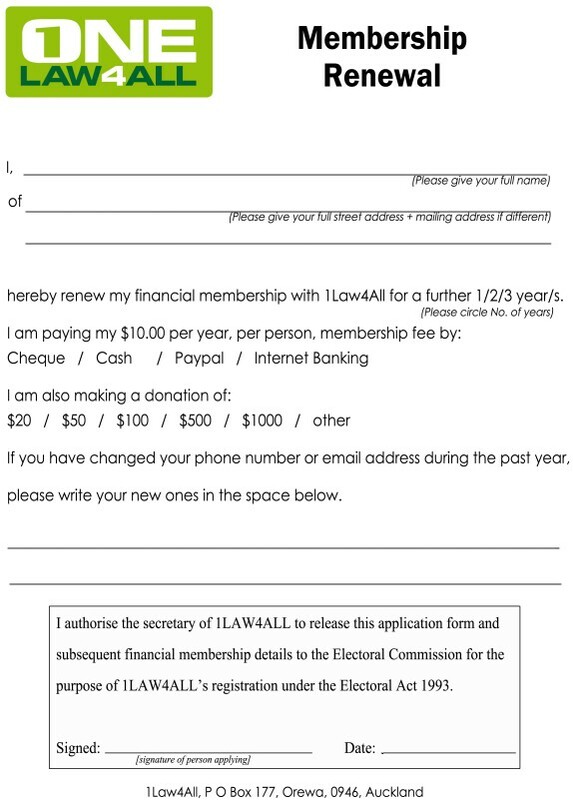 You can click here to renew your membership right here on the 1Law4All web site, where you can complete the entire process by using PayPal or electronic banking. Or you can click here to open a membership renewal form that you should be able to print from your web browser. Or you can download a form now, to complete and post, if you prefer that.